Popcorn is a favorite snack. You can make it savory or indulge your sweet tooth with a delicious white chocolate variation. This page contains white chocolate popcorn recipes. I just whipped up several batches of delicious white chocolate candy cane popcorn to give for gifts this Christmas, and it was so easy and inexpensive. I filled a large bowl with air popped popcorn. (You could use microwave popcorn, but it's more expensive.) Then I coated it with 1/2 bag of melted white choc chips with one candy cane crushed in it, and stirred until the popcorn was well coated. Once it cooled, which didn't take long, I distributed the popcorn in two-cup plastic bags that I tied with red ribbons and slapped an adhesive Christmas tag on. I made 15 bags for about 25 cents a bag. They are super cute, and lightweight to send in the mail. 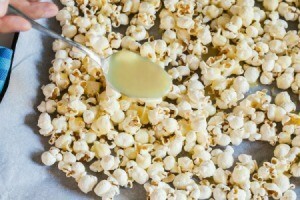 I make my own popcorn and spray it with butter flavored cooking spray. Pop the popcorn according to package directions. Pour into a large mixing bowl, picking out the unpopped kernels. Melt the almond bark according to package directions. Add the pecans or peanuts, if desired, to the popcorn. Pour the almond bark over popcorn and stir till everything is thoroughly coated. Spread the mixture on a aluminum foil as thin as possible. Let dry for 35 to 40 minutes. 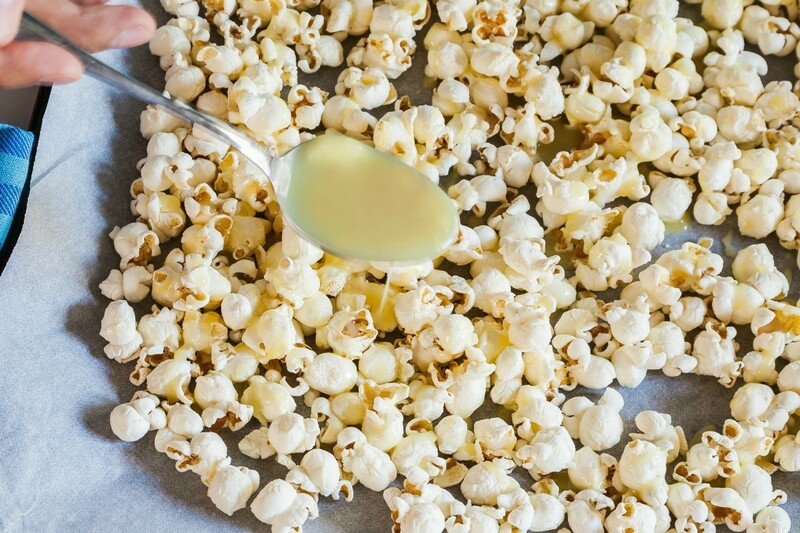 Note: You can also make using popcorn popped from scratch. Coat the bottom of a 4-quart pan with a few Tbsp. vegetable oil. Add 1/2 cup popcorn kernels. Cover pan. Turn stove top burner to medium or medium-high heat. Let kernels cook, shaking occasionally to prevent burning. When the popping slows to 3 to 5 seconds between pops, remove pan from burner. Allow to cool a minute or two. Pour popcorn into a bowl. If you want more popcorn, repeat the process but you should only do 1/2 cup at a time. Then make White Chocolate Popcorn using directions.